Beaufort Manor is a majestically restored period home, standing regally in its own grounds, dating to the eighteenth century. 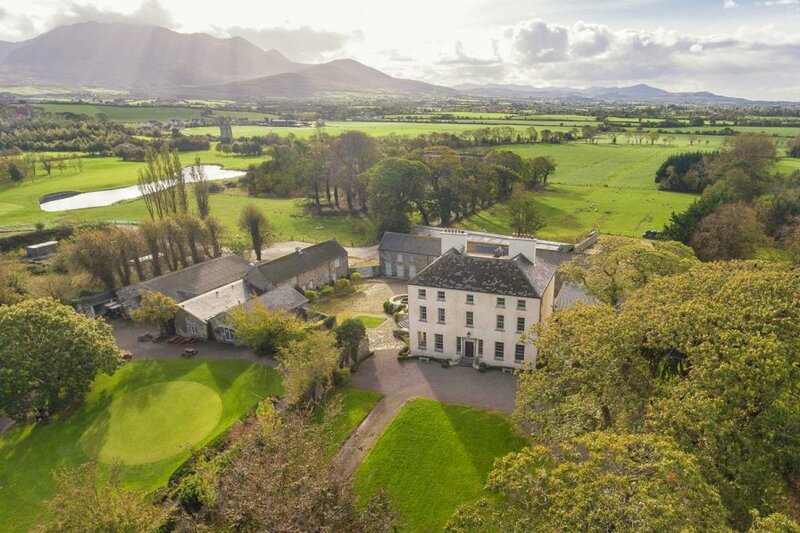 Beaufort Manor is a majestically restored period home, standing regally in its own grounds, dating to the eighteenth century, nestled at the foot of the McGillicuddy Reeks mountain range in County Kerry. This sumptuous Georgian home is classically handsome, with a gorgeous facade showcasing three storeys of generously proportioned rooms, overlooking sweeping, elegantly-maintained lawns, with mountain views as well as overlooking the historic Castle Corr. This magnificent home sits alongside the Beaufort Golf Course, one of Kerry's finest, where guests can enjoy a complimentary round of golf just a stroll away! Beaufort Manor has six stunning bedrooms, each with their own bathroom and can comfortably sleep twelve to fourteen guests, thus making it ideal for family get-togethers and celebrations within the grandeur and refinement of a large stately home. This sedate home offers all the beauty of classical architecture blending seamlessly with every contemporary comfort. The interiors offer refined elegance, plush fabrics, roaring open fires and abundant period features; the views across the sweeping lawns and mountains are striking, whilst the lawns are resplendent without being over-manicured. Guests can spread out, enjoying the calm tranquillity of the reading rooms, the opulence of the large dining room with accents of crimson velvet; the drawing room has an array of impressive oil paintings, antique polished wood furnishings and gilded mirrors. Tastefully and timelessly finished, this sophisticated home imbibes a sense of history and regal opulence, along with all the modern day comforts necessary for a family stay. The bedrooms offer four-poster beds, sumptuous florals, crisp cotton linen and far-reaching rustic views; guests are guaranteed a restorative stay. A discreet staff service can operate at guests' request; for catering, guided tours and local information, blending the best of a private home along with hotel-grade luxury. When “downtime” is in order, there is a media room with games and entertainment features for guests to enjoy after a busy day out in the rugged Kerry outdoors! Beaufort Manor is ideally placed to enjoy the wonders and magic of the windswept and majestic Kerry, in an impeccably restored and executed family home, brimming with character, history and sumptuous design, set in a tranquil and rural spot, yet moments from the warm and welcoming local life characteristic of small-town Ireland! Beaufort Manor is a stunning traditional property with a special country house feeling. It can accommodate up to 12 people (14 with 2 additional "pull out" beds) in 6 charming en-suite bedrooms. - The kitchen is fully equipped with an Aga and halogen hob, modern appliances and beautiful breakfast table looking out onto the courtyard. - 2 Double/twin rooms (1 ensuite, 1 with separate private bathroom). Beaufort Manor is set in the charming village of Beaufort on the southern banks of the river Laune, acting as a gateway to the majestic McGillycuddy Reeks. This naturally beautiful spot boasts Ireland's highest mountain, Carrauntohill, that draws thousands of climbers each year. Rich in heritage, Beaufort boasts an array of historic attractions, whilst the river Laune is known for its salmon and trout fishing. The Old Dunloe Castle and Corr Castle date back as early as the thirteenth century, whilst locally there are options for pony trekking, cycling tours, hiking trips and the nearby world famous Gap of Dunloe. The Beaufort Golf Club offers visitors an eighteen hole course with majestic views. Those keen on outdoor pursuits will be spoilt for choice: guided walks from the house, hiking trips and cycling tours are all on offer whilst day trips to Dingle, Killorglin and Tralee are all worth organising. Beaufort offers an excellent array of restaurants and traditional Irish pubs, where visitors can enjoy local Irish music and hospitality. Kerry airport is only twenty-five minutes away, whilst Cork airport is an hour and a half away.